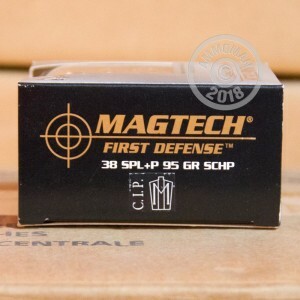 This +P ammunition from Magtech's First Defense series is one of the highest-velocity loads available for the venerable .38 Special. Each cartridge in this box of 20 fires a light 95 grain solid copper hollow point bullet at 1,083 feet per second. This high velocity combined with the the hard copper bullet produces a high level of penetration and rapid expansion to quickly incapacitate assailants. This ammo should only be used in firearms capable of handling high pressure ammo (.38 Special +P). 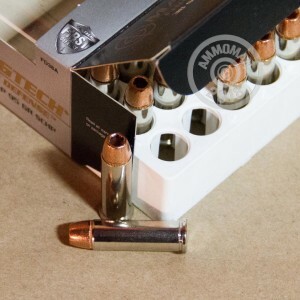 These cartridges can also be used to good effect in a .357 Magnum revolver. 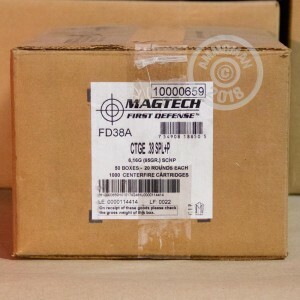 Magtech First Defense ammo is made in Brazil by CBC, a major defense contractor. CBC produces its own ammo components including the non-corrosive Boxer primers and nickel-plated brass cases used in First Defense cartridges. After shooting them, these are by far the only .38 round I'd ever carry for personal protection. I fired them in a full size .38 before firing them in my lightweight snub nose. They sound like a .44 mag going off, but the recoil was WAY less than other +P rounds I have fired.